The ServeRAID M5015 and ServeRAID M5014 SAS/SATA Controllers for IBM System x are the next-generation 6 Gbps SAS 2.0 RAID controllers. The adapters have two internal mini-SAS connectors to control up to 32 devices and support global and dedicated hot-spare drives. 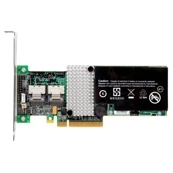 The ServeRAID M5014 controller delivers a full RAID 6 Gbps SAS 2.0 solution, while the ServeRAID M5015 provides additional performance advantages of an extended cache and a standard battery backup unit. With the attachment of the ServeRAID M5000 Advanced Feature Key, the ServeRAID M5015 and M5014 offer the option of RAID 6, RAID 60, and SED Encryption Key management.